Agilemedia established in 2007, with the help of SNS and the word of mouth, we are honored to work with many big firms both in Japan and overseas. We intend to use a new marketing concept called &quot;ambassador&quot; to offer a brand new marketing value regarding advertising. We provide a wide range of services from the advertising agency, consultation, tools development, publication editing etc.for our clients. 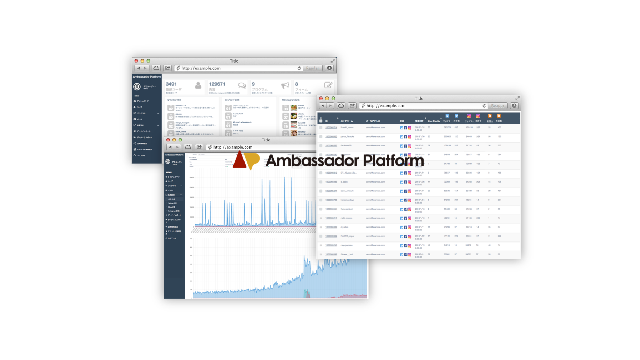 Ambassador platform is a platform providing all sorts of services from <br>ambassador discovery/ registration/ analysis/ extraction/ contact. Within one system, it is able to detect the &quot;level of impact&quot; and &quot;level of contribution&quot; of each ambassador based on SNS data. The platform is also able to collect and analyze the information sent out by these ambassadors on SNS and/or blogs.<br><br>By generating the word of mouth through our &quot; ambassador program&quot;, we are able to analyze the contribution of individual ambassador to find out who contributed the most and the true value of the particular<br>advertisement. We can also help utilize the data to come up with promotion campaigns with high-cost performance. It is a platform that connects companies and the &quot;influencers&quot; together. We offer many different reviews in different areas from daily goods, gourmet, business, web service, travel to gadgets etc. We have professional, productive influencers for each area to accommodate your needs regarding contents. <br>We have about 150 influencers working for reviews, these influencers are people who bring big impacts on SNS or blogs. If you need to have your products been promoted with ads reviews, or need influencers to attend your press conference etc. We could definitely help to mediate a great influencer according to your needs!<br>The origin of AMN is to prevent Stealth Marketing behavior from happening. As a result, we have very strict regulations regarding the format &amp; the purpose of our reviews. For example, for a blog article, we specify either is for advertising purpose or is for promotion service with either 【AD】【PR】on top of the article. And for reviews on Twitter or Instagram, we have hashtag with the word 【AD】or【PR】too.